Popular with repeat guests returning year after year, this large, spacious hotel offers great on-site facilities for couples and families. The atmosphere here is relaxed and the location is convenient for local shops, bars and restaurants. I have been back from this hotel for a week. I had been there the previous year, and I found this hotel to be excellent. This year was no different, they were doing improvements whilst we were there, but nothing that disturbed you, these changes are for the better. I believe next year there will be even more improvements. We went on this holiday this year as our honeymoon, we thoroughly recommend this hotel the facilities are fantastic. On the whole we found the meals (we went all inclusive) very good, sometimes a little repetitive, but then you get that in most places. There are a few pubs/restaurants across the road from the hotel, if you are self-catering and they are very cheap, there are also shops and about 5 mins down the road to your left there is a big shopping centre. There are also lots of shops and restaurants on the sea front which are quite reasonable too. It's a 10-15 min walk if you use the seafront walk to Porto Colon which as a lovely little bay with beach and sunbeds. This hotel has three pools, a pool bar and plenty of activity. It's a very big hotel so we used the excuse to go back because there were still parts of the hotel we hadn't discovered. The only minor fault is that the lifts are slow, if you are on the first floor it's not a problem you can walk up/down the stairs, after that you would need to use the lifts. I read a report on this site who said it was dated, but that report was in either 2006 or 2008, I can assure you this person has got that wrong. They are still improving this hotel and it was fine how it was. I would recommend this hotel to all ages you will not be disappointed. Had a terrible experience in this hotel, mainly due to being put in dirty,dated,worn and unpleasant rooms.There were cockroaches in the bathroom,apparently a problem in the lower floors of the hotel.The bathrooms were very worn with holes in the bath that had been repaired with filler and rust on the fittings.We were moved to higher slightly better rooms but no where near four star standard. The hotel is situated well,the food was average although the dining room is always very busy.Reception staff were very unpleasant but other staff were pleasant.Entertainment during the day is good but poor in the evening. The pool area was clean and sunbeds were fine. On the whole this is not a four star hotel.I think that it may have been twenty years ago but standards have obviously dropped and tour agents need to take a closer look to market this hotel honestly. We had a great time at this hotel. No worries about the room or the staff. The resturant is well staffed and they are all friendly. They are quite strict about the dress code for men at dinner but everybody else seems to get away with wearing what they want. The pool area was no hassle and not the usual towels on sunbeds at 6am. The entertainment folks will have you playing water polo and pool gymnastics every day so join in and don't be shy. We usually go for self catering but this time we fancied a change and they didn't let us down. Everything was clean and spotless. Our room was cleaned every day with regular changes of towels and bedding. We would go back to this hotel without any worries. We have been to other hotels in Tenerife and they were good but this hotel went that one step beyond to be better. The hotel was a very good hotel with a high level of activities,cleanliness,entertainment,and pleasent staff except reception. It was perhaps not quite a 4 star due probably to the decor of the rooms but the excellent food,animation team,and entertainment in the evenings made up for it.It was a little quiet outside of the hotel in the bars and restaurants like ,legends,oscars who said themselves it was quiet for the height of the season. Worth having a walk up to the costa adeje area 20 mins walk from the hotel ,bars there were quite busy especially motown magic bar. The adeje area also has lots for kids like ,trampolines,scooter bikes,mini golf,ten pin bowling,arcades,and a iceberg inflateables in the sea during the day 10 euro all day excellent value. Even though the hotel provided above average entertainment in the evenings it was a bit of a disappointent that it ended at 10,30pm then all in the karoke bar in the hotel till 12.when the bar closed! Everyone apart from those who like karoke left to outside bars around the hotel and that is the hotels loss.Having given a true account and a holiday is what you make it i am sure 90% of holidaymakers staying here will enjoy it like we all did. It does have something for everyone,and you dont have to rush down for sunbeds at silly o,clock theres plenty for everyone and if you cant see any ask a member of staff who will gladly get more out for you. Go and enjoy you holiday and live every day as though its you last,because one day you'll be right !! This hotel is fab. The decor which has been mentioned does need updating, having visited this hotel 20 years ago, is still the same. We stayed half board, and thought the food was great. The cleanliness of the hotel is superb, rooms cleaned every day. The location is also good, plenty of bars and resturants around. We used the bars a lot, as the hotel bar was very expensive , the brum bar, which is a stone throw away from the hotel, and the sports bar which along the beach front. The animacion team worked hard everyday entertaining adults and the kids. The one negative thing i have to say is there are a lot of stray cats wondering around the hotel grounds, i did notice one morning cat muck, and fleas jumping around the seating area. I informed the manager and this was dealt with. The cats dont really do any harm, but messing around the pool area is not good for the hotel. I would not book with first choice again, as we did not have a rep to tell us about various trips, or pick up time for departure. Also we paid a thousand pounds more than any other family we spoke to. I would return here again but would shop around for a cheaper deal. I look forward to returning to this hotel again, hopefully next year. I would give this hotel 9 out of ten, and think it is fab. We thought it was superb and met alot of people our own age there that were very open and friendly. The fact that the hotel is situated in such a remarkable place made it more exciting, we went to all the beaches, lol, but our favourite was the one closest to the hotel because it had the BEST doughnuts EVER!! !...in case you were wondering :P Also the resturants surrounding the hotel were good too. The room we stayed in was large and had a marvellous view of the ocean :). It was nice to come back to the room after breakfast to find it clean and orderly...when we had left it, well, not :P.
Over all, one of the best holidays ever.... if you do go to Iberostar, be creful about leaving towels to dry on the balcony wall... its very windy at times and we lost of towels more than once lol. Food was not the best we`d had on holiday but still better than ok.
Hotel very clean,rooms cleaned every day.Outside area very comfortable. Hotel on a main road but noise not noticable.Nice views. Kids club great,our 5 year old loved it,mini disco was only ok,but again our daughter loved it. Hotel shows was hit and miss,some were very good others not so. Booked again for same time next year,got a good deal from Direct Hols,would not pay or be happy with the hotel with what some other tour operators are charging. Some are 50% dearer for same week. On arrival at hotel we were greeted in a very plesent manor with a glass of bubbly,and a very helpfull receptionist , rooms were cleaned every day and towels changed to,our room was nicley sized with a small fridge.the view from our room was good a nice view of the sea and part of the town. The food in the hotel was good and plenty of choice although as with all hotels it can be repetative. Location was good short walk to the beach,lots of nice places to eat or just have a drink .only anoying thing is having holidays and prizes rammed down your throat every 5 mins witch got very boring after a bit. Entertainment looked good but we went out most nights as the drinks in the hotel were a little expensive. We would definetly go back to this hotel as you could hear a pin drop at night. 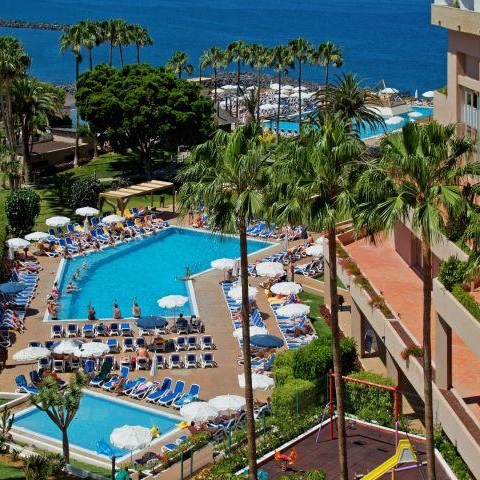 Spent 1 week at this very good 4* hotel in Tenerife. We were greeted Upon arrival at the hotel with a a glass of cava or orange juice which was a nice touch. Our room was a bit dated but clean and spacious.The maid service was excellent with clean towels everday. The food in the main restaurant was superb, lots of choice for both breakfast and evening dinner.There are 2 pools which was very good although a little chilly. The best part of this hotel is its location with plenty of good bars and resturants and shopping centre. We would go back although the rooms do let the hotel down but we didn't spend much time in ours anyway.